A kitchen, much like a closet, is one of the more under-appreciated spaces in a home — you use it every day, but don’t often give much thought to how you organize it. You probably know a few general kitchen organization ideas by now, but what about the nitty gritty rules for how to organize the different areas of your kitchen to maximize space and simplify your cooking routine? After all, good kitchen organization isn’t just about stacking dishes neatly. It’s about creating a smart system that makes your life as easy as possible. That’s why we put together this handy list of 12 simple and brilliant tips to perfectly organize your kitchen cabinets, drawers, and pantry. MakeSpace is more than just storage. To find out how you can make space in your life, talk to one of our space experts. We'll get started with the right storage plan for you. 1. Use baskets to corral similar items. 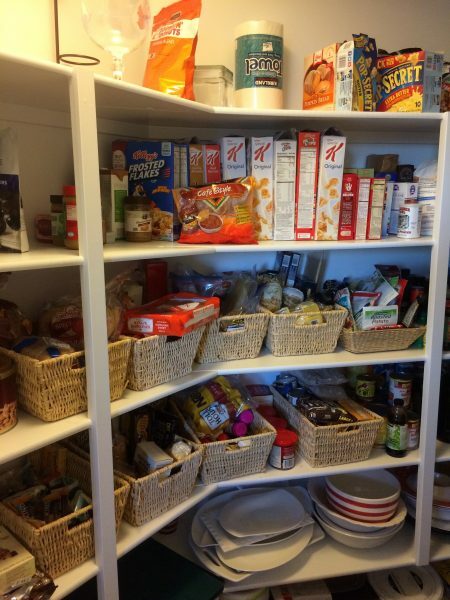 Baskets and bins are the best and easiest way to organize food in your pantry. 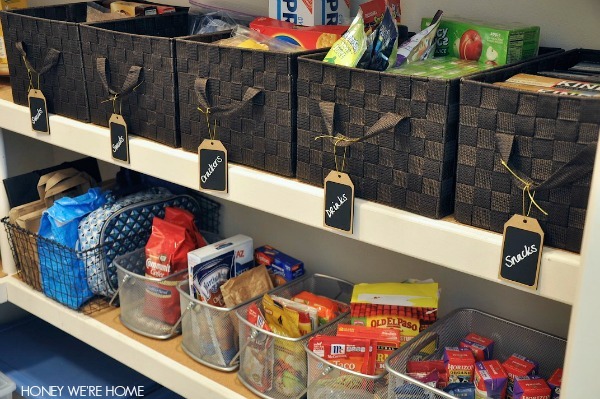 Organize your baskets by category, like snacks, baked goods, pasta, bread products, and so on. To make things even more straightforward (and more aesthetically pleasing), slap a few labels on your baskets so you know what to look for when you’re cooking dinner or assembling lunch in a rush. 2. Put everyday items at eye-level. Again, the goal here is to make your life easier. Put the food you reach for every day in the middle of your pantry at eye-level. Then store lesser-used items on the top or bottom shelves. 3. Store baking ingredients and grains in containers. 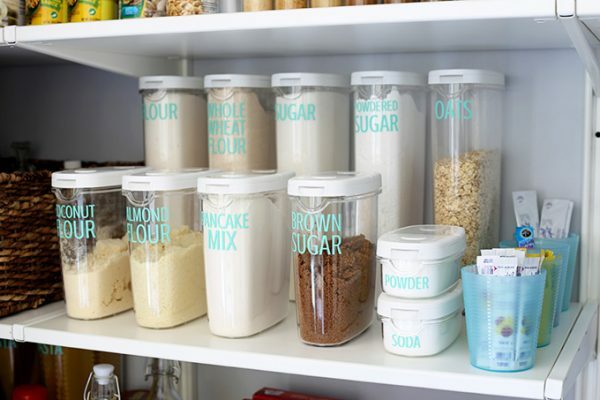 A set of matching containers goes a long way in limiting pantry chaos. Not only do containers hold more than store-bought boxes, but they also keep your food fresh and help prevent spills and messes. Invest in a set of sleek glass or plastic containers (even Mason jars will do the trick) and fill them with everything from dried elbow noodles to brown sugar. If you’re not much of a baker or cook, use them to store snack mixes, cereal, or nuts. Want more clever kitchen tips? Learn how to cook in your small kitchen with ease. 4. Keep Tupperware lids in their own box. If you already do this, we give you major props — it’s a game-changing organization trick. 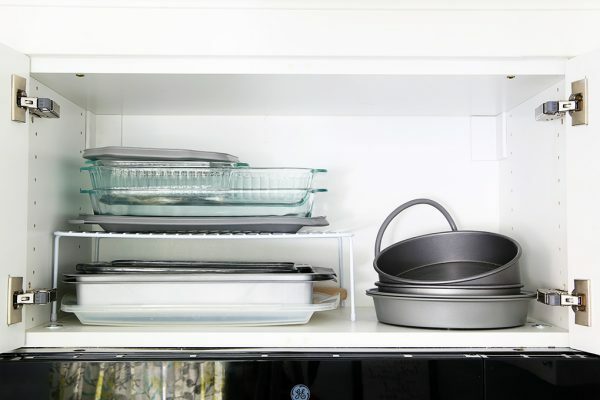 Instead of letting Tupperware lids float around your cabinet wherever they can fit — a risky move that almost guarantees you’ll never be able to find the exact size you’re looking for — stack them from largest to smallest in a separate box. 5. Put things you use every day in the most accessible cabinets. Like the trusty eye-level pantry rule, this organization strategy seems obvious, but its effectiveness cannot be overstated. Keeping your dishes and cooking tools in cabinets where you can easily reach them is key to staying sane as you navigate your kitchen. If you reach for the Tupperware after dinner every night to store your leftovers, don’t keep it in a lower cabinet — store it front and center. Same goes for anything else you use with frequency, whether it’s a giant Crock-Pot or a set of Moscow Mule mugs. 6. 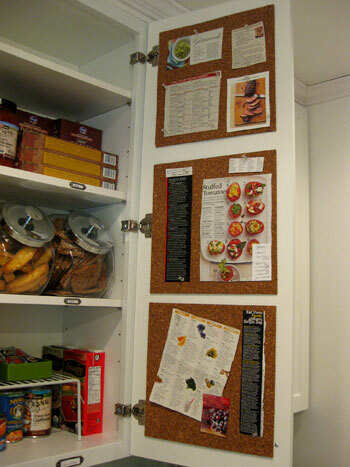 Hang hooks or a corkboard on the inside of a cabinet door to maximize space. You can also utilize the outer edges of cabinets for kitchen utensil or spice storage, as Top Reveal suggests. Your spices will be easy to see without the need for rummaging through cabinets. Free the countertops! Your cabinets (every side of them) are up to the storage challenge. 7. Put shelf risers in your cabinets. Shelf risers are the secret to doubling your cabinet space in two seconds flat. 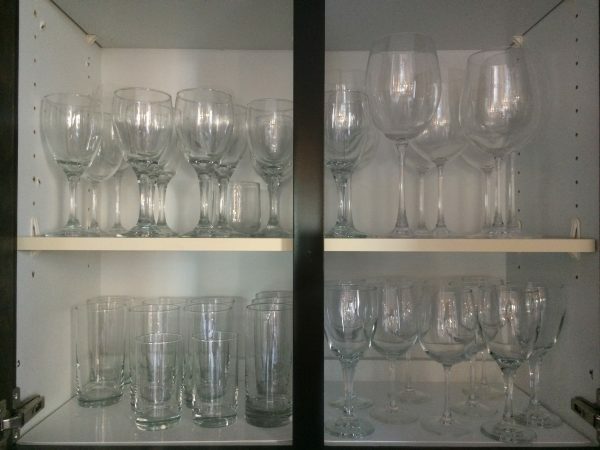 You can use them to store twice as many baking pans, casserole dishes, mugs, plates, or whatever else you need. 8. 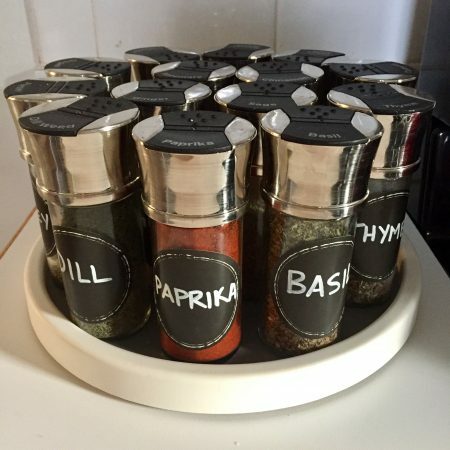 Store spices on a Lazy Susan. No more digging through a disorganized cluster of spice bottles to find the paprika nestled at the back of your kitchen cabinet. If your drawer space is limited, store spices on a Lazy Susan you can stash in a cabinet near the stove. The genius of a Lazy Susan is that it keeps everything organized, visible, and easy to grab. Free Bonus: Read our list of 7 smart ways to save space in your small kitchen. 9. 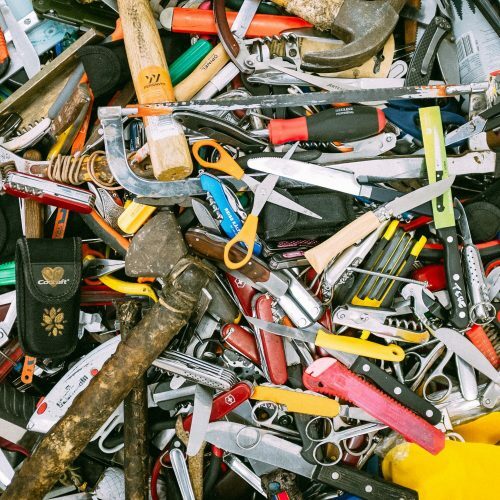 Organize kitchen tools by type of cooking. Not all kitchen tools are created equal. You might think you can store all your spatulas in the same drawer, but it’s actually easier and more efficient to separate your tools — even if they’re the same kind — by the type of cooking they’re created for. For example, the massive metal spatula you use for grilling should be kept with other grilling tools like tongs, a basting brush, and a meat thermometer. Same goes with baking necessities. 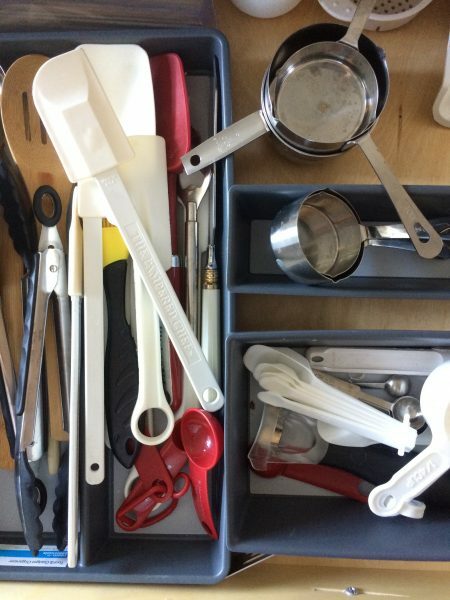 Put all your silicone spatulas, measuring cups, whisks, wooden spoons, and rolling pins together in one drawer. Free Bonus: See our complete list of 48 easy kitchen storage hacks and solutions that will upgrade your life. 10. 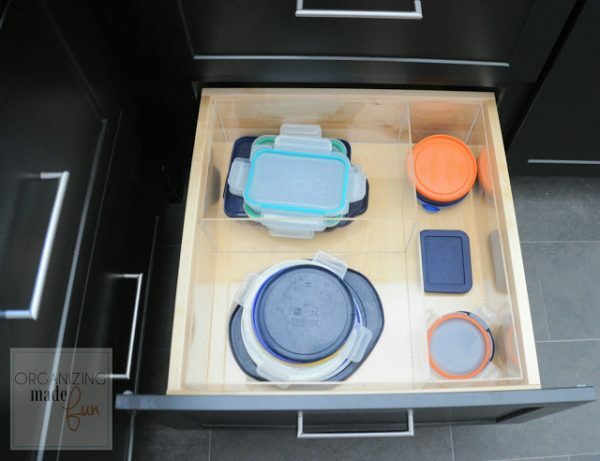 Use dividers or small bins to organize kitchen drawers. Dividers are to drawers what baskets are to pantries. In other words, they’re absolutely necessary for keeping everything neat. 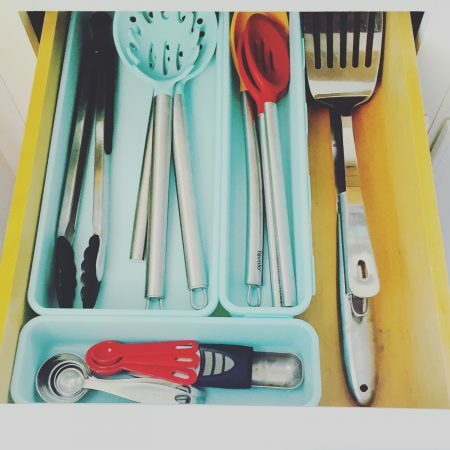 Use dividers to organize things like flatware and serving utensils. Then use small boxes and bins to organize everything else, including random junk drawer items like candles, batteries, and rubber bands. 11. Use a tension rod to store pot lids upright. 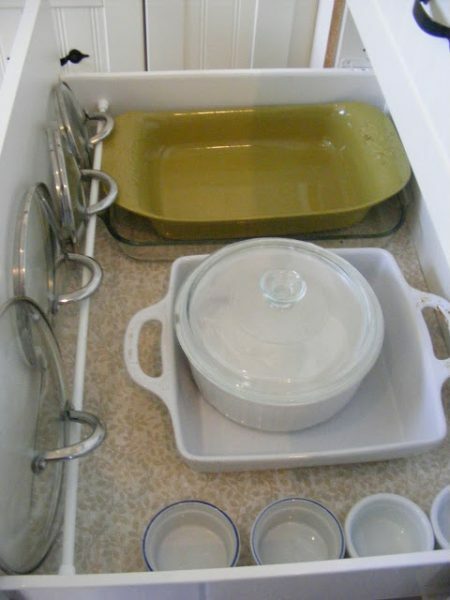 If you’re lucky enough to have a deep drawer, install a tension rod inside it to store pot lids upright. It does double-duty by keeping your lids organized and creating more space to stack your pots and pans. 12. Let MakeSpace store everything else for you. For everything you can’t fit in your kitchen, use MakeSpace. Simply schedule a pickup and pack your stuff. We’ll grab everything from your home and transport it to our secure, temperature-controlled storage facility. And when you need something back, just browse your convenient online photo catalog of your stuff, click the item’s photo, and we’ll deliver it back to you. The result: Less time wasted rummaging through your drawers, cabinets, and pantry. And more time for you to enjoy hosting Thanksgiving in your home. This article was written by Paige Smith, a freelance writer from Orange County, California who specializes in lifestyle, wellness, and travel topics. To find out how you can make space in your life, talk to one of our space experts. We’ll get you started with the right storage plan for you. Tips, tricks, and endless ways to make more space in your life. Your inbox is about to get more organized. Get handy organizational tips and space-saving hacks delivered straight to your inbox. Doh! We're not serving that area (yet). We'll let you know when we come your way.